Have you ever really wanted to do something and then had the chance to do it? Well, Mr. McGreely had just such a moment. He’d wanted a garden so that he could plant vegetables and then gobble them all up. Unfortunately for Mr. McGreely, there are very cute little bunnies who want nothing more than to gobble all those vegetables, too. 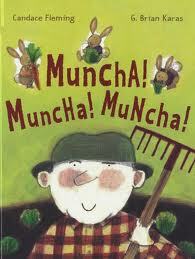 (Muncha, Muncha, Muncha). Mr. McGreely does NOT want bunnies eating his vegetables. So, he builds a small fence around his garden. “And the sun went down. And the moon came up. And- Tippy-tippy-tippy, Pat! Spring-hurdle, Dash! Dash! Dash! Muncha! Muncha! Muncha!” Those bunnies ate those vegetables again. Each day Mr. McGreely improves the fortifications around his garden. And each day, “…the sun went down. And the moon came up,” and those bunnies got into the garden. Finally, Mr. McGreely builds a wall that no bunny, no matter how clever, could ever defeat. Mr. McGreely is happy. Little does he know that those little bunnies crawled into his basket when he wasn’t looking! When it’s time for Mr. McGreely to pick his vegetables, he picks up the basket and climbs a big ladder to get to his garden. He picks his vegetables and places them in his basket. As he reaches into the basket, “Muncha! Muncha! Muncha!” Oh no! 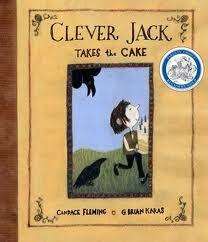 Thanks to a friend and volunteer at my school who recommended this book to me as a great read aloud for spring. She was right! My students loved it. Jack is invited to the princess’ 10th birthday party and wonders what to bring. Trading away his few possessions, he makes an incredible cake to take to the princess. But, all sorts of trouble lies ahead: crows, trolls and dancing bears, you name it. By the time Jack gets to the castle he is left with one strawberry from the cake – only to find out that the princess is allergic to strawberries! What to do? Without knowing it, and with no present left, Jack gives the princess the best present of all. My very, very wiggly third grade class sat so still you could hear a pin drop and then clapped at the end. I loved this book before today, but seeing this class mesmerized made me love it even more. The illustrations by G. Brian Karas are wonderful.